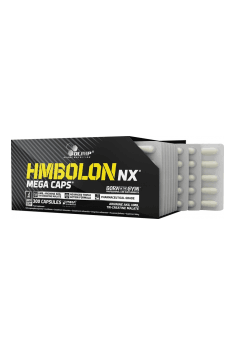 Olimp HMBolon NX is an advanced supplement that provides calcium β-hydroxy-β-methylbutyrate (CaHMB), which in synergy with arginine alpha-ketoglutarate and creatine malate supports muscle anabolism. The supplement effectively reduces the muscle damage caused by strength training and inhibits the muscle catabolism. It also promotes the activity of anabolic hormones, enhances the process of synthesis of the new muscle proteins and supports the reduction of the adipose tissue. β-hydroxy-β-methylbutyrate (HMB) - is a by-product of L-leucine metabolism, and shows similar anabolic properties as the aforementioned amino acid. HMB effectively inhibits the activity of catabolic enzymes in skeletal muscles and promotes the synthesis of cholesterol in muscles, which acts as a protective barrier against protein-degrading enzymes. It also contributes to the reduction of muscle injuries caused by training and the reduction of a delayed muscle pain. In addition, HMB increases the activity of mTOR kinase, which regulates the rate of muscle protein synthesis (MPS), and may affect the expression of mRNA – the insulin-like growth factor (MDF-1) with equally strong anabolic properties. According to the research, HMB may also contribute to increasing the amount of calories consumed, which positively affects the anabolic processes, while the reduction of body fat is also noticeable in people supplementing HMB. Arginine alpha-ketoglutarate (AAKG) - a combination of arginine and a glutaric acid salt. AAKG participates in energy production, protein metabolism and nitrogen transport in the body. It also stimulates MPS by affecting the levels of IGF-1 and growth hormone. Arginine also improves the sensitivity of tissues to insulin, which allows the construction of qualitative muscle mass. It can also be a substrate for the production of creatine and nitric oxide (NO), which facilitates the transport and distribution of oxygen and nutrients in the body. It has been shown that arginine contributes to an increase in the rate of MPS and to the level of adiponectin, which promotes fat loss. Creatine malate - the most popular substance that increases the physical capacity of the body combined with apple acid. This acid participates in the course of the Krebs cycle, which together with the creatine helps to increase the energy level in the body. Creatine in synergy with HMB promotes the building of muscle mass and strength and reduces muscle damage caused by training. In addition, it regulates the water levels in cells and contributes to their volume, and as a supplier of the phosphate group it increases the stability of cell membranes, preventing muscle damage and degradation. This substance also increases the proliferation of muscle fibers and the recruitment of satellite cells of the skeletal muscles. Creatine intake may inhibit the activity of myostatin, which as an IGF-1 antagonist limits the growth of the muscle mass. HMB itself shows strong anti-catabolic and anabolic properties, however the combination of HMB together with arginine and creatine provides even better results. Promoting the activity of anabolic hormones and the synthesis of new muscle proteins is a strong stimulus that develops the level of muscle mass. In addition, the product reduces the damage to muscle fibers, inhibits the catabolism and stabilizes cell membranes, ensuring the maintenance of cellular homeostasis. Creatine provides a phosphate group for the reconstitution of adenosine triphosphate (ATP), which is the basic energy carrier in the body. ATP is used to generate the skeletal muscle contraction and provides the energy to working muscles. Malic acid which creatine and alpha-ketoglutarate are combined with are the intermediate products in the course of the Krebs cycle. This process occurs in the mitochondria and is responsible for many metabolic pathways, including the production of ATP and cellular respiration. In summary, Olimp HMBolon NX is an advanced dietary supplement focused on the development of muscle mass. The combination of three effective ingredients that act together in synergy enhances the ability to build the qualitative muscle mass, without gaining the adipose tissue. In addition, it increases the energy and muscle strength, while reducing the muscle damage and activity of catabolic enzymes. Take one portion (4 capsules) 1-2 times a day. Regular application of the preparation positively influences building muscle mass, by inhibiting catabolic processes. Moreover, it contributes to the improvement of effort abilities. The recommended portion may positively influence inhibiting muscle breakdown caused by training and increasing strength and muscle tissue. Among others thanks to this property, the preparation may be used, e.g. during championships preparations to protect muscles. Anti-caking agent - magnesium stearate; capsule (gelatine, colour : E171).